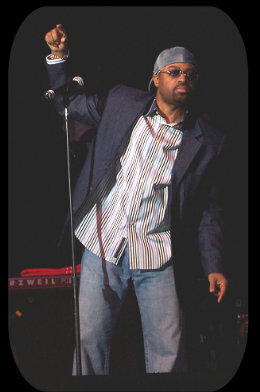 J. Moss is the multi-Stellar Award winner of 2006, having garnered three of the pointy statues, including the one for Male Vocalist of the Year. As singer, songwriter and producer, J. Moss has his hands full. Not to mention his work with PAJAM in bringing forward new talent, such as male urban trio 21:03. Read on as J. Moss tells a little of himself on this Insider Interview! What is your favorite scripture? Lamentations 3:23: They are new every morning: great is thy faithfulness. What is your most embarrasing moment? On the tour I came out and did my dance set and when we got done I went to grab the mic and there was no mic for me. The audience just looked and I didn't know what to do. What's your favorite song on The J.Moss Project?? ALL OF THEM!!! What's your favorite song on your cousin Karen Clark Sheard's album, It's Not Over?? "You Showed Me", of course, I did that one!! OK,.seriously I like "Authority" as well. What is your favorite movie? Independence Day. What is your favorite food? I love seafood. Would you say you are a singer foremost, or a producer foremost? Singer all the way. I know what God has called me to do and I wouldn't dare disrespect him by saying anything else besides singer. If I never wrote another song again it wouldn't matter. Don't get me wrong, production has its perks, but at the end of the day I am a singer.